…maybe another 3 hours work of work on the dress, and it will be DONE!!! Sharon didn’t quite finish the dress over the weekend, so I took it home to complete it while she worked on the coat.Â I’m actually somewhat relieved; I’ve put so much into the dress that I wanted the pleasure of putting in the last few stitches myself! 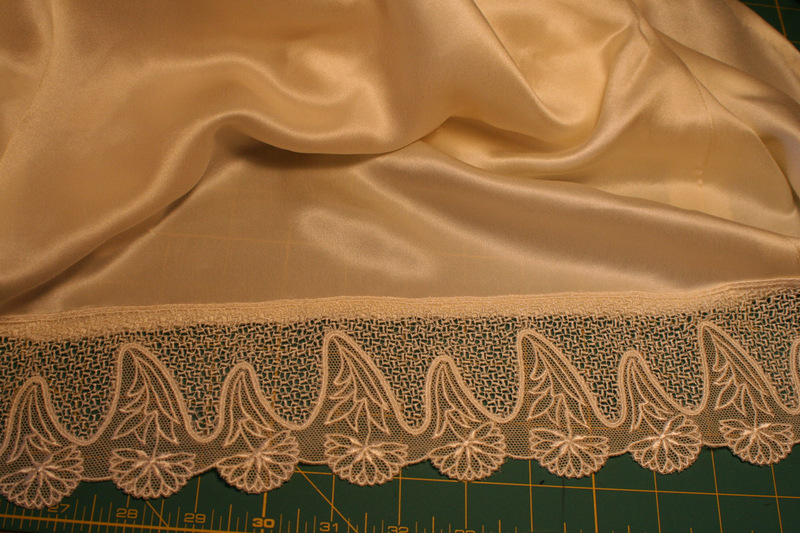 Once the lace is all done, I need to fix one small section of lace on the front (it’s coming loose), sew on the ribbons for hanging the dress, and sew in the label.Â And that, my friends, is IT! !Â Maybe another two or three hours of work.Â The culmination of nearly a year’s labor. Hmm, perhaps I had better go buy a small bottle of champagne…! Early congratulations! As someone who generally gets things only 98% done, I am impressed by your persistence and attention to detail. And make sure you keep the champagne away from the dress!